*Certified Lead Free to NSF/ANSI 372 and NSF/ANSI 61. Meets all Federal and State Safe Drinking Water Acts and requirements including California Prop 65. All foot valves furnished with Buna-N O-Ring, stainless steel spring and stainless steel locknut. 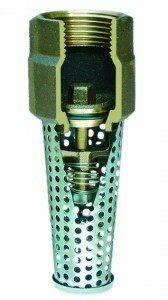 All foot valves have a working pressure of 400 psi. Call our Live Support Team!